The screen resolutions available to a desktop computer depend on the monitor you plug in, and how it's detected. For laptops, the screen resolutions Windows 7 / 8 / 10 shows you depend on the built-in LCD display panel. Since 2011, all Intel processors (CPUs) come with "Intel HD graphics", a graphics card built right into the processor. Strictly speaking, it's a GPU (graphics processing unit), but it works the same way as far as the operating system is concerned. 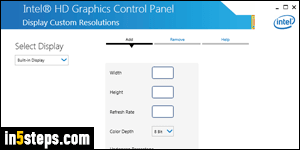 If trying to change screen resolution doesn't give you a choice you like, Intel graphics has a Control Panel to create your own. It's not easy to find, because this is an advanced feature that most people should avoid. To launch the applet, locate it under the following path, or type the entire path in the Run dialog: C:\Windows\System32\CustomModeApp.exe - make sure that the drive letter (C: by default, matches the one on which Windows is running). Read the warning notice, shown in the first screenshot, and click Yes to proceed. A very simple screen will open: enter the width, in pixels, of your custom screen resolution; type the height, also in pixels. Now pick a refresh rate: a value of 60 (Hertz) should be supported by any monitor; only go above that refresh rate if you know that your hardware supports it! 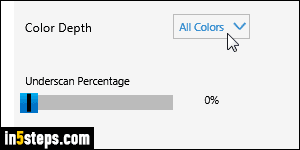 As far as color depth goes, picking All Colors should work for any recent display panel. Leave the Underscan Percentage slider alone. Although you can enter a custom resolution that uses a different aspect ratio than the one your display uses, it's best to keep it the same. If you are unsure, check that the width and height you entered belong to your display's image ratio. Nearly every monitor manufactured over the past 5-6 years uses a 16:9 aspect ratio, also used by high-definition (HD) TV screens. That helps you can watch TV on your PC! Now click on the Add button in the bottom right corner to add your new resolution, and click Yes to confirm. 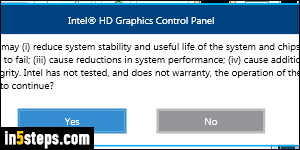 You can close the Intel HD Graphics Control Panel. Minimize all your windows, and right click on an empty area of the desktop. 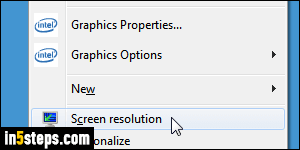 If you choose "Screen resolution" to launch the Windows Control Panel, your custom screen resolution will now be listed in the dropdown! Bonus Tip: although recent iMacs and MacBooks (Pro / Air) also come with Intel processors and GPUs, things work a bit differently. 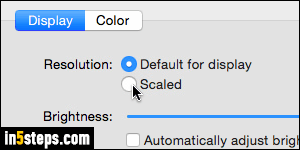 See how you change screen resolution on Mac OS X. (Hint: modern versions of Apple's operating system use non-scaled resolutions, but you can switch to a pixel-based one.) To come up with your own numbers, use this screen resolution calculator.